Haleeva Sunshine is family hostel for everyone looking for economic travel,great experience and thai service.We are located on Aonang beach,in a peaceful environment allowing for great relaxation.We are open to all comments from customers as we realise the importance of great customer service. All 20 rooms are designed to exude a hostel small boutique color full and decorated with local materials and varity of color,Set among the lush tropical garden and best panorama of mountain view. * Hot & Cold shower with free amenities. * Room price is exclusive of breakfast. * Beach towel is 30 baht/item/day. * Free beachmat and umbrella. * Free Luggage and Shower room 24 hr after check out. Hong Island - Best beach in Krabi. * Within 1 minute walk from hotel you can find 7-11 , banks , motorbike shop , local restaurant , pharmacy , Salon , Diving Shop , Clinics. 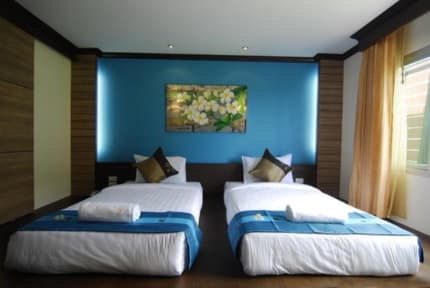 The hotel is located in a quiet area where there is a growing business area around ; Phamarcy , 7-11 , Clinic , Mcdonald , Local restaurant , Diving shop and etc. Please note that the hotel has no elevators. Guests booking Superior rooms will have to walk up 3-4 flights of stairs. ( it's not recommend for older / pregnant or people who have problems with legs. Please note that rooms with town view are facing the street and has a balcony, while the remaining rooms with mountain views are on the back of the property and has no balcony. Please be informed that each room can accommodate 2 adults + 1 Child (4-10 years of age). An extra bed is required for children older than ten years old. Please kindly note that buffet breakfast is available only during peak season. During low season (May-Oct), breakfast set is available for 150 Baht per person. Please contact the hotel directly for any additional information. The hotel is near to the mosque. There is an early praying at 5.15 am everyday. We advise you to bring your own ear plugs or request the superior room with mountain view side as it's quieter by remarking when booking. 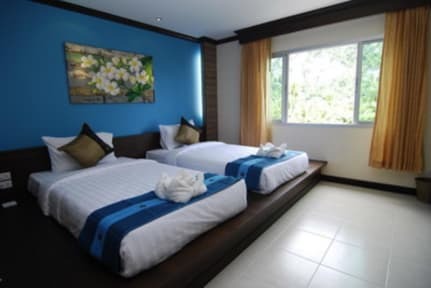 For the superior room with mountain view request , it's not guarunteed 100% depending on subject to availability upon arrival but we will do our best for your best sleep quality. 3% charged on credit card payment. All request is subject to availability , its not guaranteed 100% but I will do my best for your request. Good place to stay. Was only there for the night and flew out in the morning, so I don't have much input. Loved the pool, great view of the rock mountain by Railay beach. My only complaint is the security, I stayed in the dorm and the only door between myself and the outside world did not lock. Though Ao Nang is super safe, it was a little anxiety-inducing! Good location and supportive staff!! Many transportation was arranged by the hotel staff , Found swimming pool to be very dirty. Good hostel. Very clean and comfy. Only 10 minutes walk from the brag WiFi didn’t work in room on first night but was fixed quickly. After check out we were able to leave our bags and have a shower which was much appreciated Also booked a taxi for us back to the airport for 150baht. The rooms are really big, nice view and looks like a hotel. The staff is helpfull, and helps you with whatever you need. They wash rooms and change towels every day, air con is good. 10-12 min to walk to the beach, shopping and restaurants all the way down. 7eleven and mcDonalds is close by. Really recomand it. Nice place to stay. Our private twin room was quite large with comfy beds. The air con in our room didn’t circulate very well and the wifi on our floor was weak at most times. The maids cleaned our room the one time we asked but didn’t empty the garbage. Other than that lovely stay with great staff. I had problems with my Visa card back st home and hey let me use their phone to call to fix it. Not a hostel, this is basically a hotel. Location is a little far away from the beach, but the walk is nice. Close to cheap eats, great pool and the room was exceptional. No hostel vibes, but great private rooms. Nicely located on main street in Ao Nang, not a very social hostel. It was quite and the beds were comfortable, the room didn't lock but they had big lock boxes for your bags. It's was about a 10 min walk to the beach where all the bars stay open late and playing loud music. Staff was so sweet and helpful! They let me check out later in the day because I had a night flight. About a 15 min walk to Ao Nang beach. Bad for solo travel - very quiet and reserved atmosphere. They make you take your shoes off before going in the room. 3 bathrooms so there’s never a wait. Pool in the back is nice for lounging after a day at the beach. 0 security; anyone could just walk right in which was a little scary. Overall not a bad stay.